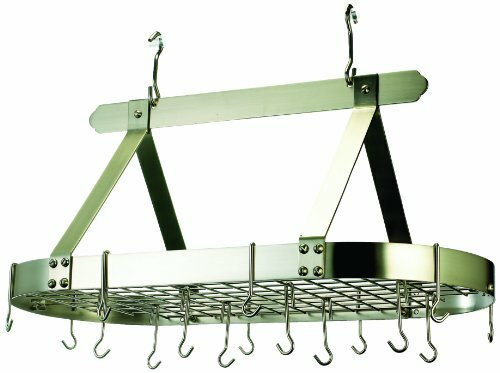 This 16-hook pot rack gives you plenty of hanging space for your pots and pans. The center grid can also serve as a shelf to store books, lids, or any other cooking necessities. Constructed of heavy-gauge steel, this pot rack is strong enough to support everything you need to hang. Don’t worry about cluttering your kitchen ever again, this pot rack is a convenient space saver. Includes grid, 16 hanging hooks and mounting hardware. Finished with a durable yet easy to maintain Satin Nickel exterior. Assembly required. Tarnish resistant Satin Nickel finish.